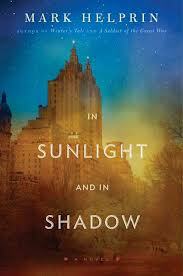 I loved Helprin’s Winter’s Tale (1999) and knew I wanted to read In Sunlight and Shadow as soon as I saw it. Fortunately it was selected for the 21st century reading group but then I postponed actually starting because – omg – it’s 700 pages! Well … Winter’s Tale is 768. Oh wow – and that continues through Chapter 1 but Chapter 2 we meet 32-year old Harris (Harry) Copeland, a moderately wealthy young man, who is newly returned home to New York City from duty in WWII. And then we meet his aunt and finally, in Chapter 3, the object of his desires, the beautiful and wealthy Catherine. There are LOTS of specific references to exact places in and around upper Manhattan as well as a few in Brookly and Staten Island. And because I don’t know New York at all – I’m trying to use some maps and old photos.